SAPPORO – As Japan moves to shift away from nuclear power, wind power, a potential key player among renewable energy sources, faces a stubborn foe: lightning. Hokkaido hosts 266 windmills, the most among Japan’s 47 prefectures, and about 90 percent of them are located along the Sea of Japan coast, where lightning frequently occurs between fall and winter. But no definite way to solve the problem is in sight and operators of these windmills are struggling to cope with lightning-caused breakdowns that threaten their operations. 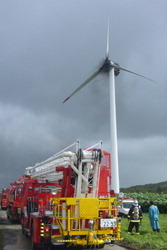 On Oct. 2, a fire broke out at the Sarakitomanai wind farm in Wakkanai. A lightning alert was issued at the time and the operator, Sarakitomanai Wind Power Corp., suspects lightning was responsible for the fire. According to the New Energy and Industrial Technology Development Organization (NEDO) and the Central Research Institute of Electric Power Industry, there were 795 windmill breakdowns between 2004 and 2009, and lightning accounted for 197, including 33 in Hokkaido. Dealing with lightning is a problem shared by wind power operators around the world, but it is particularly important in Japan. Many of the country’s windmills are situated along the Sea of Japan coast, where lightning occurs frequently by global standards. Lightning occurs when there is a violent convection of air while large differences exist between temperatures high in the air and on the earth’s surface. The Sapporo District Meteorological Observatory says lightning frequently occurs around the towns of Tomamae and Suttu in early autumn due to cold fronts from Siberia, and the lightning occurrences gradually advance southward. The fact that many windmills are manufactured in accordance with European standards has added to the problem. Getting repair parts from abroad raises costs and can keep the windmills offline for several months.